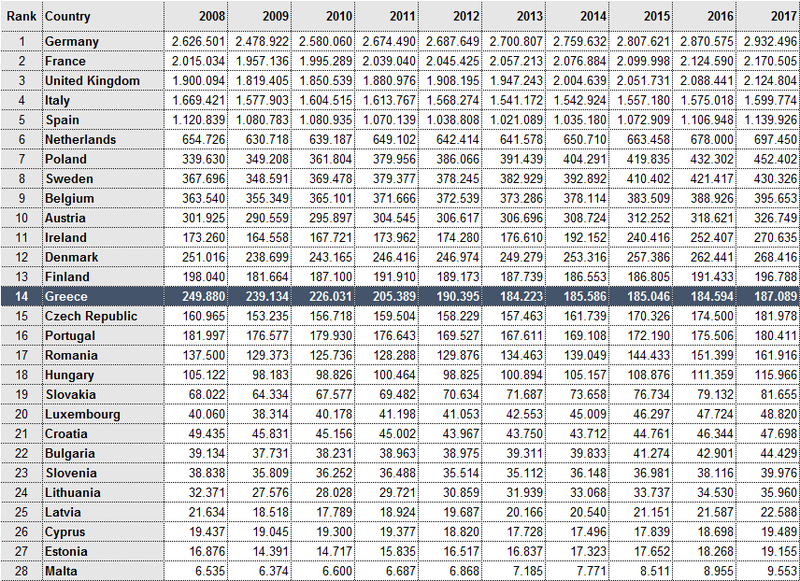 Is Greek property market finally leveling out? After almost ten years of falling house prices, the fall is slowing down and seems that things are finally turning around. The protracted downturn in Greece’s property market has gradually eased from 12.08% in 2012 to 2.2% in 2017 and, according to a survey recently published by the Greek Central Bank , the downturn slowed even more in 2018. According to Knight Frank LLP, one of the world's largest global property consultancies, Greece’s housing market is gradually improving, holding the 48th spot among 57 global markets on residential and commercial property consultancy Knight Frank’s Global House Price rankings. In the 83rd Thessaloniki International Fair (TIF) Greek property insiders told that real estate now is being sold off much quicker than in the past with nearly seven out of 10 properties purchased in the first half of 2018 concerning realty that was on the market for a long period of time. At the same time, property transactions and construction activity are both rising again, raising hopes that prices are starting to respond to a recovering economy, while many economists expect prices to level out soon. Statistics can be used to distort reality! Yes, I am well aware of that, and in fact I absolutely agree. 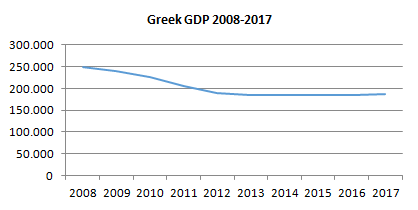 After all the wrong use of statistics – sometimes even fake - led Greek economy to the dead end and brought the economic crisis. Therefore I will try to connect the average price index data with other aspects and ratios of the economy that historically and statistically have a direct impact on the property market, the GDP and the Public Investment. GDP refers to the total market value of all goods and services that are produced within a country per year. It is an important indicator of the economic strength of a country. Greece’s economic prospects improved after it signed up to a third bailout package worth up to 86 billion euros ($107.3 billion) three years ago. In 2017, Greece's real GDP increased by about 1.35% compared to the previous year and the European Commission predicts 2.5% growth per year in 2018 and 2019, while is projected to strengthen, remaining above 2% until 2022. 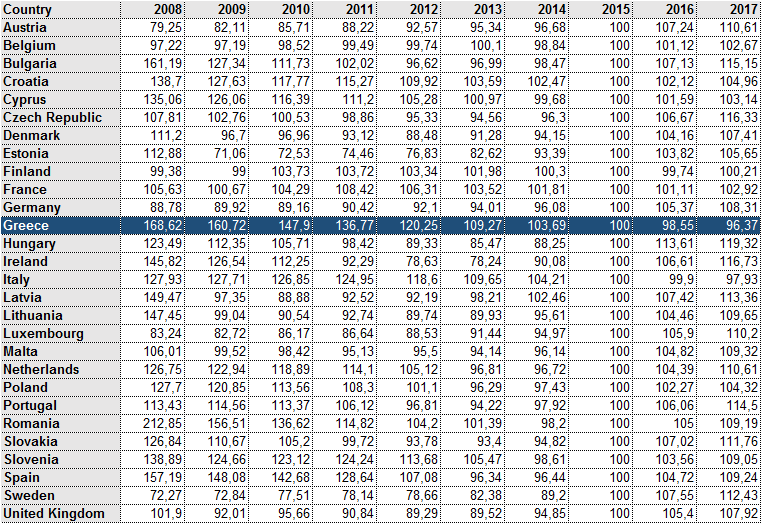 Although Greek economy faced a ten year economic recession, in terms of GPD, still remains the 14th (out of 28 countries) economy in the European Union and 20th (out of 50 countries) in whole Europe. 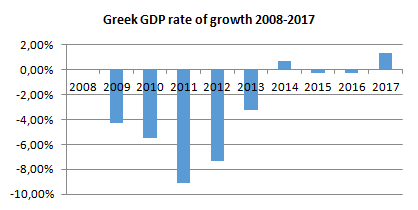 In its latest Economic Survey of Greece, the OECD recognizes the remarkable reform effort of the past two years. The study highlights that the credibility of public finances has markedly strengthened, after an unprecedented fiscal consolidation, boosting investors’ confidence in the country’s prospects. Public investment in infrastructure is widely believed to exert a positive impact on private investment. According to studies, in contrast to developed economies, public investment in developing economies complements private investment, and additionally, on average, a 10 percent increase in public investment is associated with a 2 percent increase in private investment. And although Greece is considered to be a developed country, because of the extended economic recession, we could accept that this theory could apply for Greek economy. The Public investment for 2018 is considered to reach 6.5 billion €, for 2019 7.3 billion and until 2022 almost 30 billion in total. If this is the case, public investment may not only spur economic growth directly but also indirectly by promoting private investment. I guess we have enough reasons to believe that slide in property prices slows as the overall economic recovery gains traction. After all every why has a wherefore. Today, property in Greece is several times cheaper than in most European Union member countries. According to Statista, it is one and a half times cheaper than in Spain and Germany, twice less than in the Netherlands and Sweden and almost three times cheaper than in Italy and Austria. Nevertheless, despite the positive developments, Greek Government is still facing important challenges (unemployment, poverty, low wages etc). Addressing these and other challenges will crucially depend on the continuation of the reform effort.